Candy-hued balconies against white stone facades, shimmering turquoise waters, cities that are like open-air museums all spiced with the history and flavors of the Mediterranean—this is Malta. Though it is small, the island chain packs a big punch and quickly won a place in our hearts. While we had just 4 days in Malta, we were able to squeeze in a lot of the island’s highlights along with a visit to amazing Gozo. Here are some of the best sites and experiences on our Malta itinerary. Marsaxlokk (pronounced marsa-schlock) is all about bright colors, so we made it one of the very first places on our Malta itinerary. 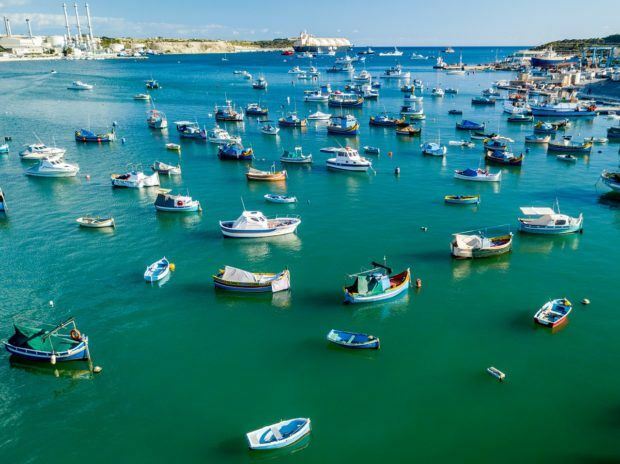 Every day, the blue waters of this cute fishing village are filled with traditional Maltese boats called luzzus. Painted in bright blues, yellows, and green, the luzzus are the centerpiece of the town. The boats range in size from somewhat small to very small (it’s hard to imagine more than 1-2 people can fit in some of them). The considerable fleet provides much of Malta’s seafood. 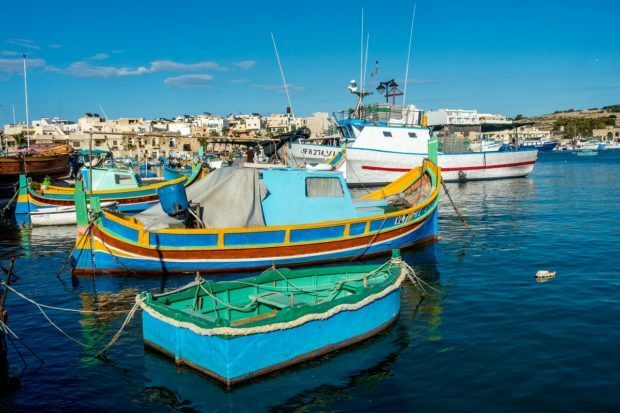 On Sundays, Marsaxlokk is one of the best places to visit in Malta. Check out the open-air fish market selling the morning’s catch, including swordfish, tuna, and the popular local lampuki (aka mahi mahi). You can buy straight from the fishermen to cook up later or grab a seat at one of the seaside cafes and enjoy some of their finest seafood with a glass of wine while watching the activity all around. Even if you can’t make it on Sunday, Marsaxlokk is a great place for lunch and enjoying the atmosphere. Wondering where to stay in Malta? You’ll find more details about where to stay in Malta at the end of this article. St. John’s Co-Cathedral is a place for people who think they don’t love churches. 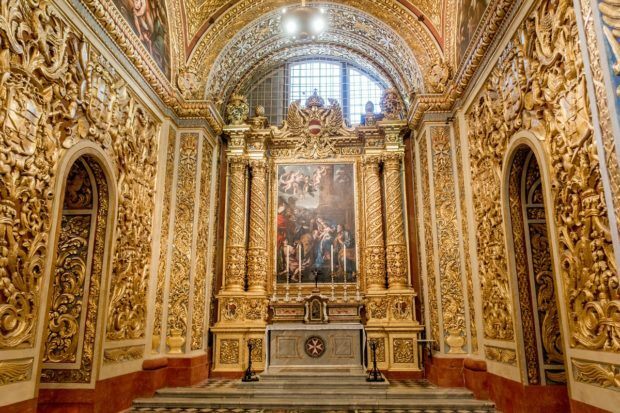 On an island that is said to have a church for every day of the year, St. John’s Co-Cathedral is more than just a house of worship—it’s a magnificent work of art and one of the top things to see in Malta. St. John’s Co-Cathedral is also, without a doubt, one of the most ornate churches in the world. Built in the 16th century for the Knights of St. John, every inch of St. John’s Co-Cathedral is covered in marble, gold, paint, or relief. Even the multi-colored floors demand attention. The church’s audio guide gives plenty of detail and helps direct you through a space that can get quite crowded, especially when river cruises are in port. Don’t miss the oratory which is home to Caravaggio’s largest painting, the Beheading of St. John. 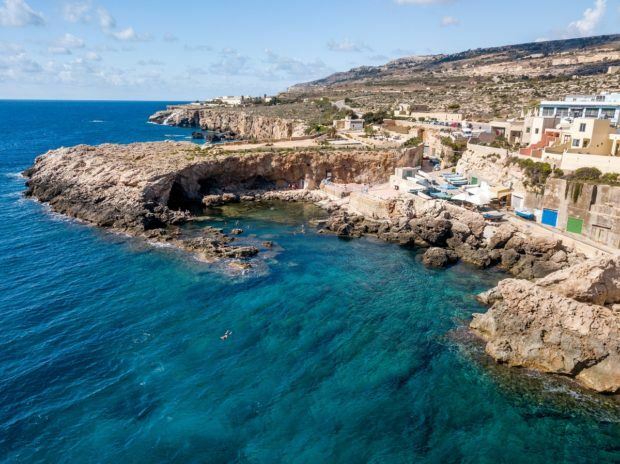 One of the hardest swimming spots in Malta to reach, Fomm ir-Rih is worth the effort on a nice day. After a 20-minute (somewhat rough) hike downhill, we were deposited on one of the most isolated Malta beaches. In fact, we only saw four other people during our visit, and three of them were from the same family. The Fomm ir-Rih bay is a great snorkeling spot when winds are calm, and the views from the pebbly beach of the surrounding cliffs are incredible, especially near sunset. If you’re up for the hike, we recommend wearing good shoes like these that are sturdy enough for the climb and that you can also get wet because the slippery stone beach can make getting in and out of the water quite a challenge. Our visit to Malta was part of a larger trip that included a visit to nearby Sicily. Read more about our week in Sicily. A fascinating mix of Mediterranean flavors with a dash of British and northwest African influence thrown in, Maltese food is flavorful and delicious. 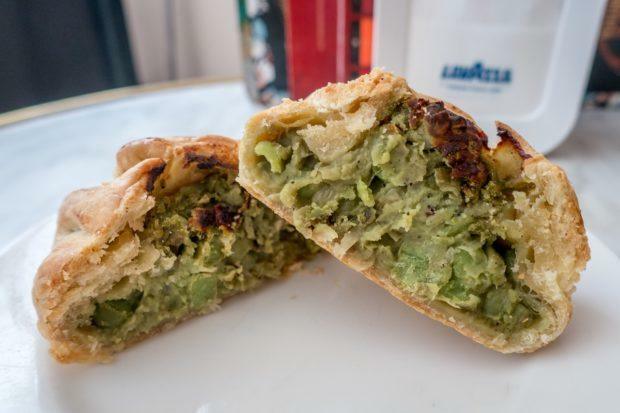 The most popular must-try street food is pastizz, a hand-held pastry filled with either mashed peas or ricotta. They’re filling and really cheap at about 40 cents each. In traditional Maltese restaurants, you’ll find items like rabbit stew, stuffed vegetables, baked macaroni pie, and Gbejniet, a mild sheep or goat’s cheese. Our favorite stop for Maltese food was Gululu, a waterside traditional restaurant in St. Julian. They have a massive menu full of local items, but our favorites were their ftajjar, a Maltese pizza made on typical ftira bread, and kapunata, the Maltese version of ratatouille. The capital of Malta until the 16th century, Mdina is a walled medieval town. 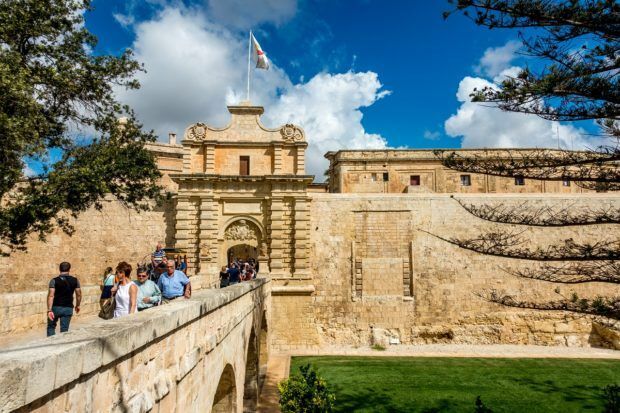 Inside the fortification, it seems like all the buildings and structures are the color of sandstone—a stark contrast against the occasional draping of wisteria and bright balconies Malta is known for. Mdina is imposing and majestic at once and feels like it belongs in another world, or maybe we’ve just been overly influenced by its part as a set for the early Game of Thrones episodes. Its fewer than 300 inhabitants come from long-standing noble families, so its sparse population and relative lack of cars have helped Mdina be referred to as the “Silent City.” It is truly a unique place and was one of the highlights of our 4 days in Malta. 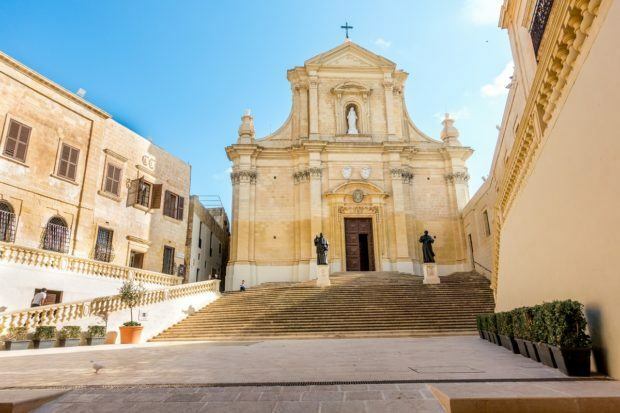 Visitors to Mdina can marvel at its Baroque-style architecture, wander through the town’s charming streets, or visit the beautiful interior of St. Paul’s Cathedral, a tribute to the saint who is said to have shipwrecked on the island. Tourists can also visit the Cathedral Museum, one of the best religious museums in Europe. 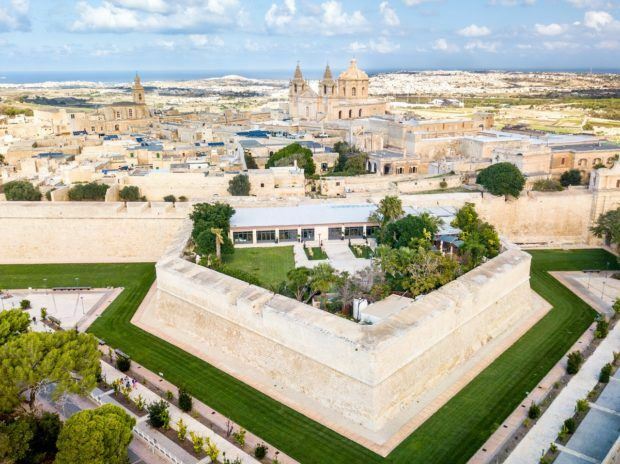 Don’t miss the panoramic views from Bastion Square. Just a few minutes’ walk from Mdina is Rabat. Not to be confused with Rabat/Victoria on Gozo or Rabat, Morocco, Malta’s Rabat is so named because Rabat means “suburb” in Semitic and the city was once a suburb of Mdina. The town is known primarily for St. Paul’s Grotto, a cave where the saint reportedly lived after his shipwreck. It’s also the home of the catacombs of St. Paul and St. Agatha, which were a cemetery during Roman times because the dead could not be buried within the city walls. The city is a feast for those (like us) in love with Malta’s balconies. For a literal feast, check out the Crystal Palace, which has probably the best pastizzi in Malta. We also loved the bakery kiosk in front of the Collegiate Church of St. Paul, which has a number of traditional pastries, cookies, and candies. 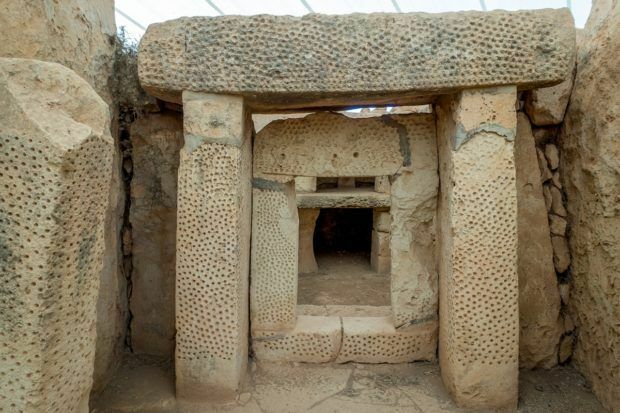 The megalithic temple complexes of Hagar Qim and Mnajdra are one of the most ancient sites on Earth and one of the top Malta attractions. Built from 3600-3200BC, they’re older than Stonehenge and Ireland’s passage tomb Newgrange. A visit to this UNESCO World Heritage Site starts with a 3D movie about the temples followed by a self-guided tour of the ruins themselves. 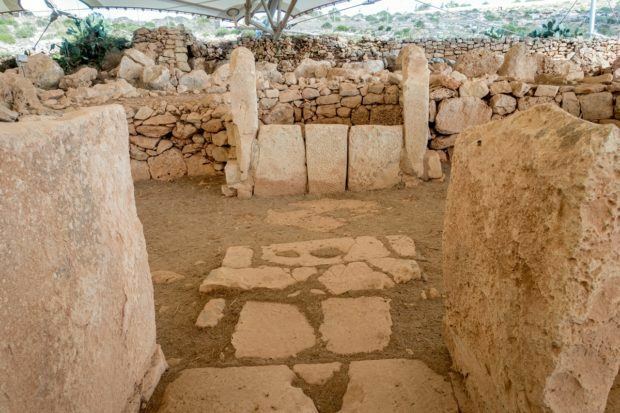 You can walk through the rooms and passageways and under the monumental doorways of Hagar Qim and Mnajdra and see the stone furniture and carvings of their builders. Though very little is known about the builders or the purpose of the temples, visiting them is still a fascinating experience. Just up the coast from Hagar Qim, Ghar Lapsi is a natural swimming pool perfect for cooling off on a warm day in Malta. The clear blue and green water is fantastic for snorkeling (lately, we always travel with our own equipment), and it’s a popular dive site. The pool is protected from strong waves, and it’s easy to swim out into the open ocean for more snorkeling and exploring. 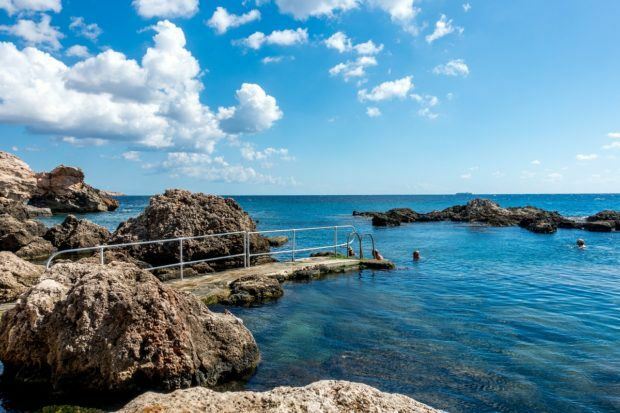 There’s no beach to speak of at Ghar Lapsi—just rocks and a cave to escape the sun, but the beautiful swimming spot has a platform for jumping into the ocean, which is really all you need for a perfect outing. If you can make the time, a stop at Ghar Lapsi is a must do in Malta. There are so many things about the colors and landscape of Malta that are awe-inspiring. One of our favorites was the bright balconies that line many streets in Valletta, Rabat, and beyond. The enclosed balconies are painted in every color of the rainbow from traditional green to brilliant blue to shocking red. It seems like something out of Romeo and Juliet. 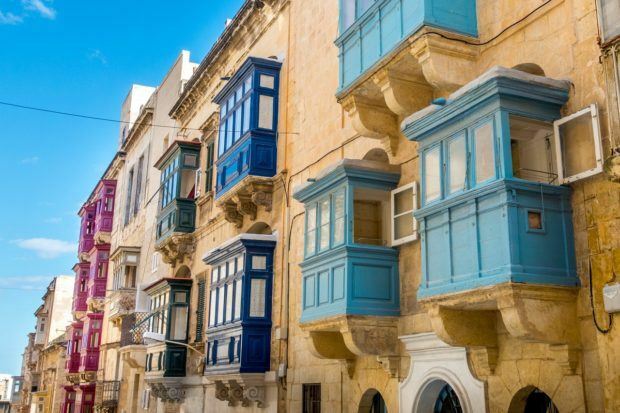 The origin of Malta’s balconies is unclear—some sources say they’re a result of the 17th-century Baroque movement while others attribute them to an Arab influence. Whatever the reason, they’re a part of what makes Malta so unique. City squares in Europe are made for wandering and people-watching. That’s certainly the case with St. George’s Square (aka Palace Square), the largest square in Valletta. 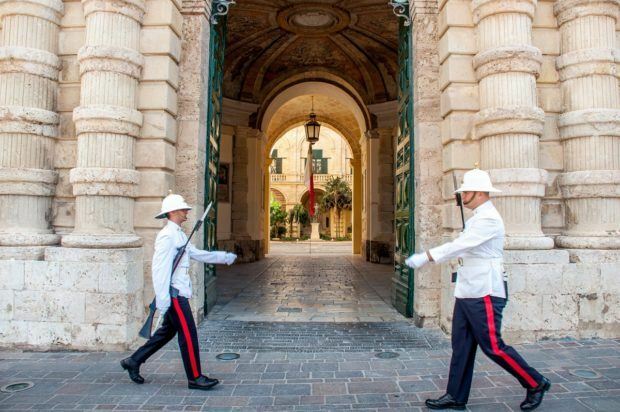 Right in the heart of Malta’s capital city, the square is home to the Grandmasters’ Palace and the Main Guard building. Admire the beauty of the centuries-old buildings, lose yourself in the rhythmic water fountain, or watch the Changing of the Guard in front of the Presidential Palace. 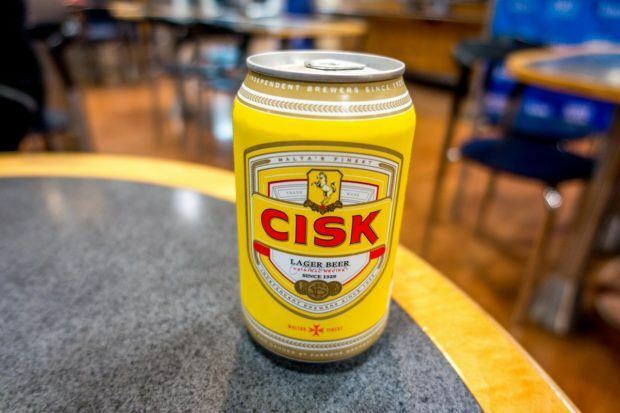 The locally brewed Cisk (pronounced Ch-isk) beer is the most popular beer in Malta. The golden lager is light and refreshing—just what you want when it’s hot out. Just north of Valletta, St. Julian’s is the center for nightlife. The coastal area is lined with restaurants, cafés, and bars, but there are also plenty of quiet places to get away from the activity, too. 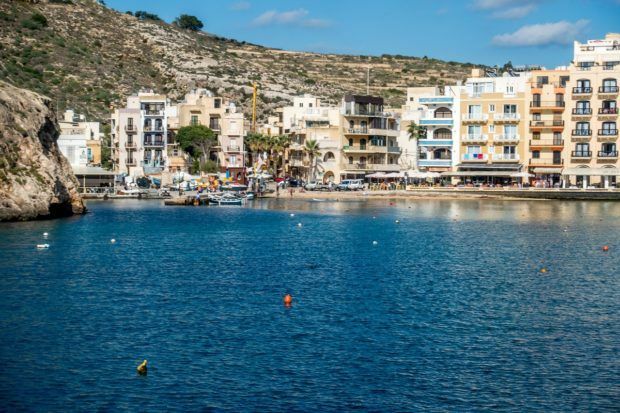 During the day, popular activities include relaxing in Ballutta Square, visiting the boatyards in Spinola Bay, wandering the promenade, swimming, and exploring the Spinola Palace. At night, all the restaurants and bars come alive with tourists and locals, particularly in the Paceville area. Our favorite restaurant in St. Julian’s was Gululu for traditional Maltese fare, and Badass Burgers was a good option for something not Mediterranean. For most places, reservations are probably a good idea during high and shoulder seasons. Just a 20-minute ferry ride from Malta, the island of Gozo has spectacular sights and plenty of room to explore. 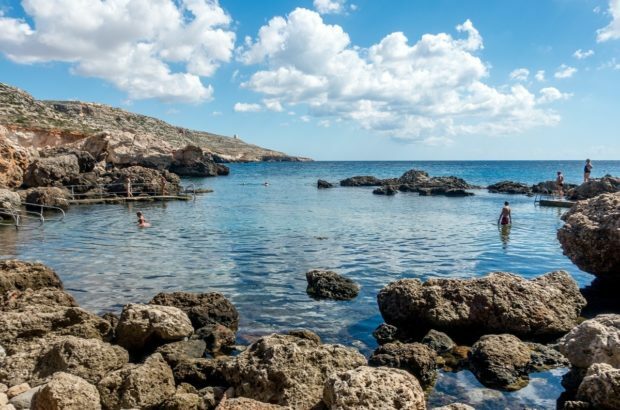 We recommend getting there early, especially if you’re visiting in the summer because it’s one of the top things to do in Malta. 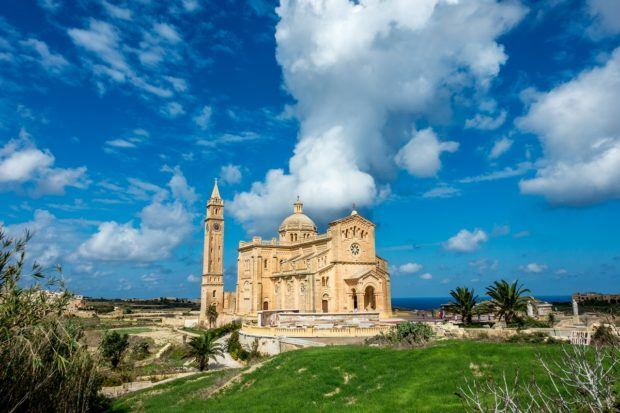 This visit to Gozo was just a day trip, but we would love to return and spend a couple of nights—Gozo is worth it. We’ve written even more about things to do in Gozo here. The hilltop fortress known as the Citadel is one of the top places to visit in Gozo. The area has been inhabited for millennia, but the current incarnation of this walled area of the capital city dates from 1551. The Citadel is home to several museums and a 500-year-old prison once run by the Knights of St. John, where you can visit the old cells and see centuries’ worth of graffiti from the prisoners. There are also several chapels and the Cathedral of the Assumption, a 17th-century Baroque church, which is impossible to miss. While the main attractions are worth a stop, the best parts of visiting the Citadel are wandering through its old lanes and taking in the views of Gozo from the fortress walls. 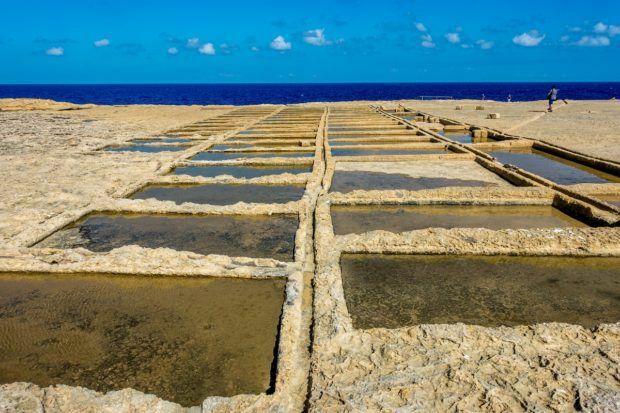 Just three miles from the Citadel near the village of iz-Zebbug are a group of salt pans cut into the coast. The interlacing pans—some of which date back to Roman times—are still used for harvesting salt from the sea. The combination of the rocky coast, the breaking waves, and salt pan mosaic was one of the most unique things to see in Gozo. 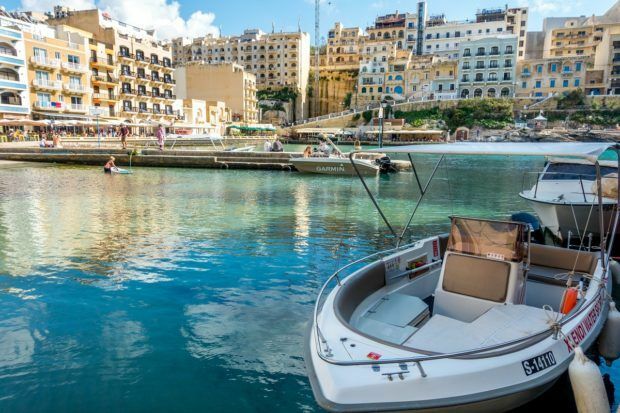 The fishing village of Xlendi is a perfect spot for lunch and soaking up the sun in Gozo. The seaside promenade is lined with restaurants and cafés where you can watch fishermen bringing in their catch of the day. There is a small sandy beach and plenty of points for snorkeling, swimming, or diving in the bay. No matter what, take a few minutes to climb the steps for views of the bright blue water below. I hope it’s clear how much we absolutely loved Malta. But there was one place that left us a bit confused—Dingli Cliffs. On the west coast of Malta near Rabat, Dingli is one of the highest points in Malta at around 825 feet (250 meters). While the views at Dingli weren’t bad, there was nothing overly remarkable about the cliffs here. Maybe we weren’t at the right spot or didn’t have the right angle. 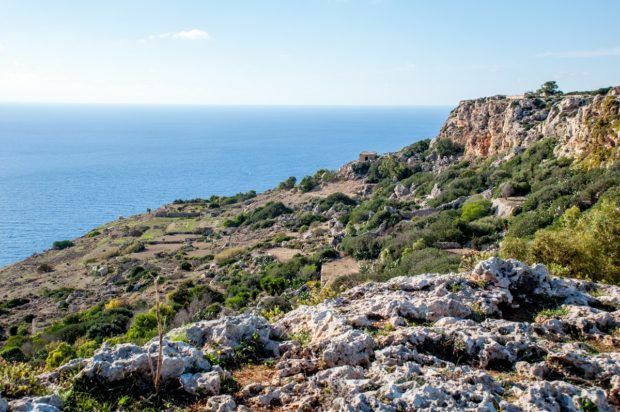 Maybe we were jaded after seeing places like the Cliffs of Moher, or maybe we were just so impressed by the rest of Malta and Gozo that Dingli just didn’t quite live up to our expectations. Either way, Dingli Cliffs were skippable for us. 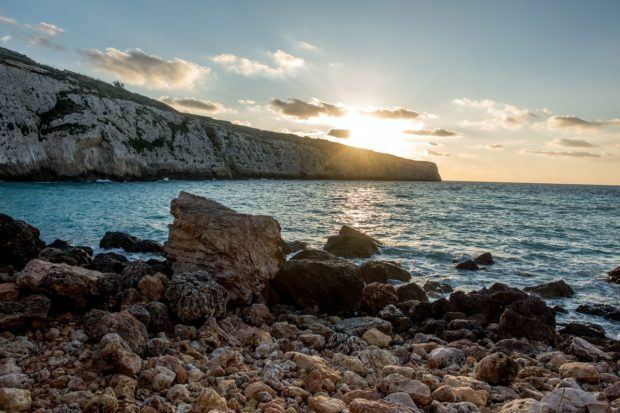 With lots of sunshine year-round, Malta is a great place to visit during most of the year. 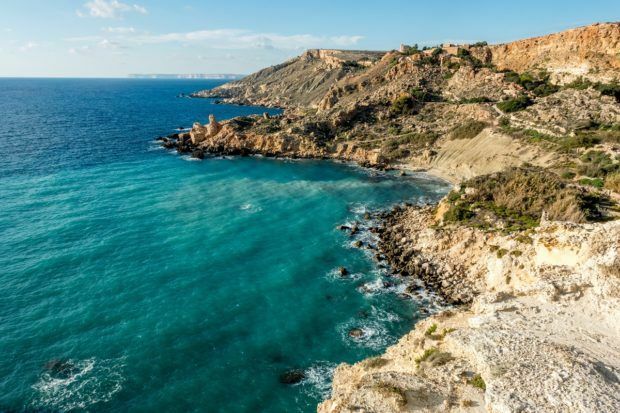 April through October are the warmest months, so if swimming or diving is on your agenda, this is the best time to visit Malta. We visited in mid-October and temperatures were still in the mid-80s. Winter in Malta is cool, and attractions have more limited hours or are closed completely. It’s worth noting that Malta is very small. 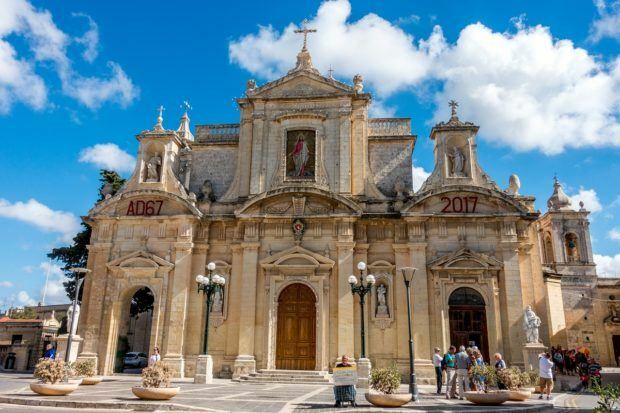 Combined, the area of Malta, Gozo, and Comino is only 10% the size of Rhode Island, the smallest state in the U.S. Crowds—especially in Valletta and getting around on buses—can be a challenge, so keep that in mind when you’re choosing the timing of your visit. Malta is practically in the center of the Mediterranean Sea, so it’s easy to reach from most European cities. Major carriers fly regular routes as do budget airlines like easyJet, RyanAir, and Wizz Air. Taking the ferry to Malta from Sicily can also be a great option. As with a flight, the specifics of your journey depend on your departure point, the service you choose, and the time of year you travel. Our trip on the Virtu ferry was approximately 1 hour 45 minutes. 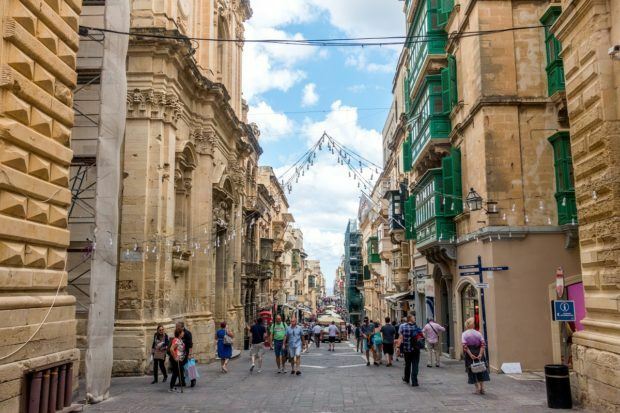 Tourists stay in three primary areas in Malta—Valletta, Sliema, and St. Julian’s. Valletta—The capital is the best place to stay if you’re interested in history and culture. Nightlife here is more limited than in some other neighborhoods. Most hotels in Valletta are boutique hotels rather than large chains. There are unique options like a Palazzo Prince d’Orange, a 17th-century palace, or the modern SU29 Hotel. Sliema—This quiet, more residential area still has a great selection of restaurants and shops and a lovely promenade. Sliema is well-connected to Valletta by ferry. The 4-star Victoria Hotel, which features a rooftop pool and luxury spa, is just a 5-minute walk from the promenade. The highly-rated Palazzo Violetta is a great value and offers free parking at their modern studios and suites. Some rooms come with kitchenettes and 40″ flat screen TVs. St. Julian’s—St. Julian’s (particularly Paceville) is known for its nightlife, but it’s great during the day as well with lovely views along the water and lots of restaurants to choose from. We stayed at Le Meridien Hotel and Spa, which is quiet and has an amazing rooftop pool. 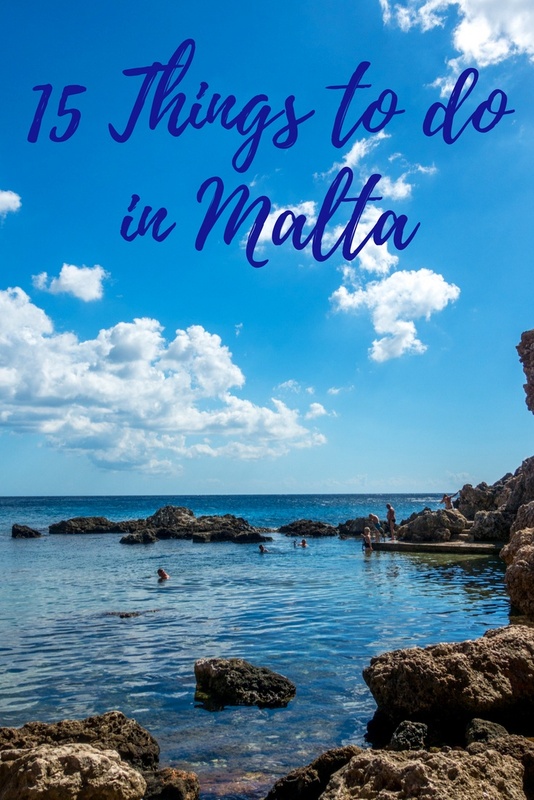 What do you think about 15 Things to Do with 4 Days in Malta (And 1 to Skip)? Thanks for the article Laura! I hope I can visit Malta someday!